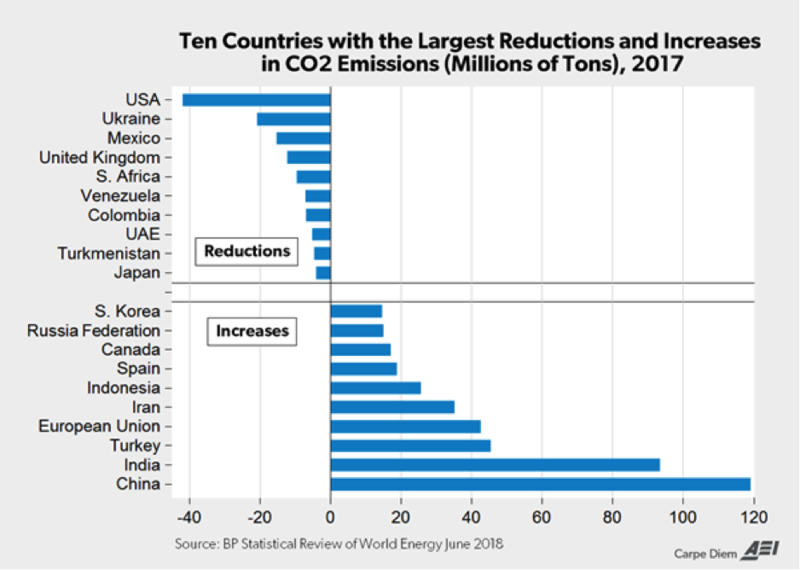 No other nation in the world has accomplished as much as the US in CO2 reduction, thanks to the shale revolution and the avoidance of the renewables trap. The United States announced its intentions to withdraw from the Paris climate agreement last year, but still reduced its carbon dioxide emissions more than any other country in the world in 2017. In fact, it was the ninth time in this century that the United States has had the largest reductions in carbon dioxide emissions in the world. U.S. carbon dioxide emissions declined by 0.5 percent or 42 million metric tons in 2017. It was the third consecutive year that carbon dioxide emissions declined in the United States. Globally, carbon dioxide emissions increased 1.6 percent to 33.4 billion metric tons—an increase of 426 million metric tons. The rate of growth of global carbon dioxide emissions last year was faster than the 1.3 percent average growth rate of the previous 10-year period. The world largest emitter of carbon dioxide emissions is China, whose emissions increased by 1.6 percent in 2017—by 118 million metric tons, or almost 3 times as much as U.S. emissions were reduced. According to the BP Statistical Review of World Energy, China produces 28 percent of the world’s carbon dioxide emissions. India is the world’s third largest emitter of carbon dioxide and had the second largest increment (93 million metric tons) of carbon dioxide emissions in 2017, more than twice as much an increase as the U.S. reduction. Together, China and India accounted for almost half (212 million metric tons) of the increase in total global carbon dioxide emissions (426 million metric tons) in 2017. The world’s increase in carbon dioxide was more than 10 times the reduction of the United States. One of the strategies for reducing carbon dioxide emissions was to decarbonize the generating sector—mainly by reducing coal and increasing renewable energy, particularly wind and solar power. This strategy has been part of the plan for the European Union and for the United States under former President Barack Obama’s Clean Power Plan. An interesting result from the BP data is that the world has essentially made no progress towards decarbonizing its electricity sector over the last 32 years. In 1985, 36 percent of the world’s electricity was generated from low-carbon sources (hydro, nuclear, renewable energy). In 2017, 33 percent of the world’s electricity was generated from low-carbon sources. Increased generation from non-hydroelectric renewables (solar, wind, biomass) provided only about half of the increase in world electricity demand over the last ten years. China and India remain large generators of coal-fired electricity, producing 67 percent and 76 percent of their electricity from coal respectively. The United States made progress in moving toward decarbonization of its generation sector by generating 36 percent of its power in 2017 from non-carbon sources compared to 27 percent in 1985. Non-hydroelectric renewables produced 10 percent of U.S. generation in 2017. The European Union has also moved toward decarbonization, generating 55 percent of its power from non-carbon sources compared to 40 percent in 1985. In 2017, the European Union generated 20 percent of its electricity from non-hydroelectric renewables. The European Union’s share of global carbon dioxide emissions, however, is only about 10 percent. France is still generating over 70 percent of its power from nuclear energy. However, other countries, such has Germany and Japan, are moving away from nuclear power. Since 2001, when Germany’s nuclear plants were at their peak performance, Germany reduced its generation from nuclear power by 56 percent. The country has turned to wind and solar power, generating 22 percent of its electricity from those sources and backing them up primarily with coal-fired electricity. Germany produces a higher percentage of its electricity from coal (37 percent) than the United States (31 percent), the world’s largest holder of coal reserves. Japan’s nuclear power generation was reduced to almost zero in the aftermath of the 2011 tsunami that hit several nuclear power plants. Japan’s nuclear generation is now at just 9 percent of its peak level reached in 1998. To replace the lost nuclear generation, Japan generates some electricity from wind and solar power (almost 7 percent), has increased its production of electricity from gas plants, and continues to use coal for electricity generation. Global carbon dioxide emissions increased in 2017, despite the Paris Accord—a pact made by almost 200 countries to voluntarily reduce their greenhouse gas emissions. The United States was one of the few countries that decreased its carbon dioxide emissions in 2017. In fact, it had the largest reduction in carbon dioxide emissions. China and India both increased their carbon dioxide emissions, together contributing about half of the increase in the world’s carbon dioxide emissions. Countries have targeted the generation sector as the most effective means to reduce carbon dioxide emissions, replacing coal-fired generation with renewable energy. However, globally, the generation sector has not made progress in moving toward decarbonization over the past 32 years.